Cy-Time has become one of Lazpiur's leading partners after another recent agreement to market and provide technical support for Lazpiur's pin insertion and electronics machines in China. Lazpiur has taken a significant step in the consolidation of operations in the Chinese market. It has reached an agreement with the Cy-Time company to manufacture the BEGItech ECD machines built for China. This machine was designed by Lazpiur to verify the dimensions of different parts through high resolution vision. It is ideal for First Article Inspection as well as for sampling or carrying out statistical control of production parts. This agreement comes after six years of partnership of both companies, during which time Cy-Time has worked as a distributor for Lazpiur in China for all types of inspection machines. Lazpiur also performed market research, concluding that the BEGItech ECD machines have a high sales potential in the Chinese market. This is particularly the case for manufacturers of fixing hardware for the automotive and aerospace sectors. 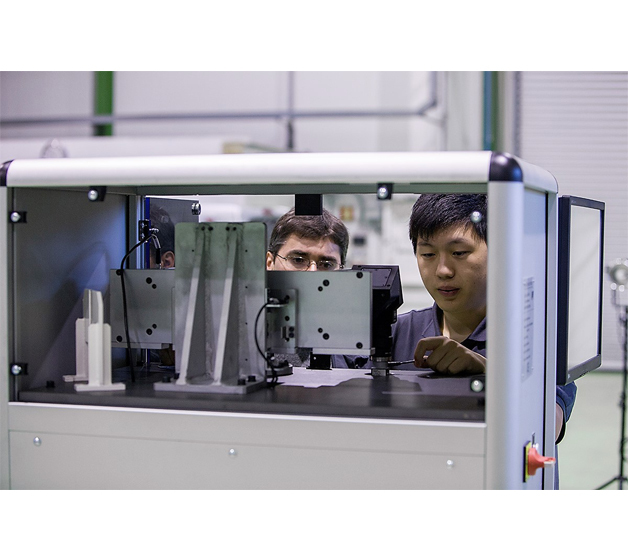 The acceptance of this machine by the industry in China will be boosted by the combination of two factors: it is manufactured by a local company in China and it has the technical backing of a company recognised for innovation, as is the case of Lazpiur. Both companies have made good progress in training the Chinese employees who will produce the machine. Several employees of the Chinese firm have travelled from Peking to Bergara to acquire all the necessary knowledge to offer a comprehensive service in the manufacture and after-sales servicing of the BEGItech ECD. This agreement between Lazpiur and Cy-Time builds on another recent signing, as a result of which the Beijing company became responsible for the sales services and technical support in China for another range of Lazpiur machines, the pin insertion and electronics machines. The BEGItech ECD is part of the large family of inspection machines manufactured by Lazpiur at its Bergara headquarters in Gipuzkoa. The company is considered to be a leading manufacturer at global scale in this sector thanks to high innovation standards. Lazpiur operates in 25 countries on four continents and supplies to automotive multinationals such as Daimler, Ford and Volkswagen, as well as TIER 1 suppliers such as GKN and Lear among others. The company manufactures machinery that fall three main categories: electronics, fastener inspection machines and bespoke machines. All machines are designed for different sectors.